SOCHI, Russia — Ukraine captured a rare gold medal on Friday, its first of these Winter Olympics, while leaders back home were trying to pull the country back from the brink of civil war. 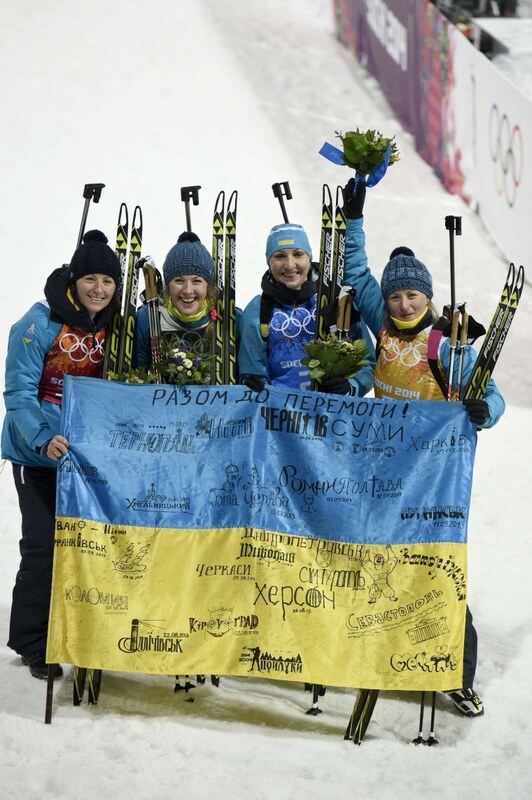 Four women wearing Ukrainian blue and white finished a biathlon relay in just over an hour and 10 minutes for the win. It was also only Ukraine’s second medal of any kind in Sochi. The other was a bronze. This was only the second winter gold for Ukraine since the breakup of the Soviet Union. The first was in figure skating in 1994, when Oksana Baiul beat Nancy Kerrigan for the gold medal at the height of the Kerrigan-Tonya Harding drama. On Thursday, a Ukrainian Alpine skier announced that she would pull out of a slalom event in solidarity with protesters at home who have fought deadly clashes against security forces this week in the capital, Kiev. The head of the national team, pole vault legend Sergey Bubka, said he hoped the team could inspire the people of Ukraine by staying in Sochi and competing. The Ukrainian gold came hours after President Viktor Yanukovych agreed to early elections and to give up some power in hopes of ending the bloodshed. At least 77 people have been killed this week in a fight over whether the country should embrace Russia or Europe.